Weatherman: It sure has been a long winter. Anchorman: Yeah, and I’m starting to get whiney. I bid farewell to whiney last week. I departed from whiney, made a left at irritated and annoyed, and took the next exit straight to SEASONAL AFFECTIVE DISORDER: Population: 10 million. This is the part of winter when we start to remember summer as if it’s a deceased relative: someone long gone, you think fondly of. Remember when Summer days would end at 8:30 at night? Remember how Summer would be really warm and you could plan to spend your whole day outside? Remember how we would eat at outside at that cute little restaurant and have bruschetta and wine? Summer is a memory — a vague, distant, longed-for memory. I tried to walk to a cafe this afternoon just to get out of the house. Big mistake. It’s rained for two days, and the snow lay atop deep trenches of icy water. I would put my foot on what I thought was solid snow only to have it drop another eight inches into cold water. It was a drag. My backpack felt heavy and cold. I was unhappy and annoyed, but I walked on until I found a cafe. A local favorite, I assumed it would be empty because of the weather. But alas, wireless is free there, and there was not an empty chair in sight. 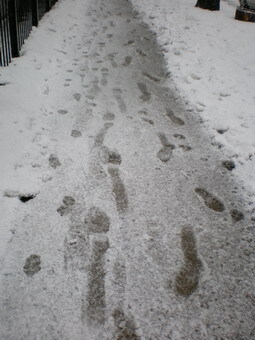 I walked more blocks to the next one and on my walk in slush and snow and ice I counted my breaths. Seemed like the sensible thing to do at the time. And we had learned it yesterday. Walking meditation is like sitting meditation except, well, you’re walking. Each exhale is a step and each step is counted. So: exhale, place a foot, ONE. Inhale, lift foot, place foot, exhale, TWO. Needless to say, no one’s power walking like this. And the hands are held at the solar plexus, the right hand cradled by the left. I walked eight blocks like this. Sometimes counting, sometimes not. And I walked in complete isolation and anonymity. What would have been noticeable walking behavior in the summer is not noticed in the winter as other pedestrians pass by, heads down against the wind. It was like I was alone out there, just walking. It took twice as long to get to the cafe, and when I arrived, it was empty. Unlike the other cafe, the wireless is free but sometimes difficult to log into, and I couldn’t connect. I stayed anyway. The lack of internet access probably did me more good. No time-sucking e-bay browsing for me. But I didn’t work as much as planned. 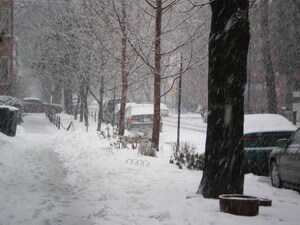 Instead, I watched the determined snow fall and fall. I watched it blow horizontally against buses and cars. I listened to the frequent hi-pitched whirr of car engines trying to extricate themselves from the snow. I waited. And watched. Somewhere under all this, I thought, summer is still alive. Not deceased. I think one of the features of Midwestern personalities is a quite determination (which isn’t to say other regions aren’t determined, but I didn’t feel this quality in say, Louisiana). We have to wait things out here. Winter ends when it ends. Summer comes when it comes. Learning to adjust to the Midwest winter in all its extremes has been a challenge for me. Life improved when I began to accept winter, but here I am in the middle of this long season, feeling not so grateful, and a little, dare I say, hopeless. When summer does arrive, because of the long winter it will feel like all of Chicago had taken some sort of magic happy pill. The first fifty-degree day, no, even a mid-forty degree day, we will all jump onto our bikes or walk outside as if summer was some magic gift. Can you believe it? We will all say. Fifty degrees! I’ll see joggers in shorts. Women with babies power walking in capris. Outdoor cafes could open. It will be glorious and strange. And this day, today, waiting for the snow to end will be a dim memory. A memory as dim as the one I am having right now about summer. Ah, but in June when I am writing post about glorious summer days riding my bike, eating gelato, and walking on the lake will you have wished you DID move here, if you didn’t? Summer is that much more magnificent because occasionally we have long winters like this one. It’s still a great place.